Those of us who wish to save the Torrey Pine tree at 4633 Long Branch Avenue in Ocean Beach won a small battle at the last OB Planning Board meeting, Wednesday, December 1st. We won a temporary reprieve from the Board – as the City has been threatening to chop down the tree within the next thirty days. The Board voted unanimously to give the parties thirty days to do testing and evaluations, develop alternatives to removal, and to return to the Board with their results. A battle was won – yet the war may still be lost. The majestic tree on the 4600 block of Long Branch dominates that entire block – I know as I lived on that very block for over five years until just recently . It – along with at least one other Torrey Pine on private property – gives that block a special feeling and look. The foliage from the tree spreads out – up and across the street until a virtual canopy of pine is formed for that part of the block. It’s shady and cooler during the summers. That block of Long Branch – has always been one of the most green blocks in OB, a block with a bounty of trees and bushes. I’ve noticed that since the early Seventies. Of course, over time, a number of the trees have been removed, and the block is not as green as it once was. But as you drive down the block or happen upon it – you can’t get away from the visuals of towering dark green pine and the effect it has. Now imagine all that … gone. … It’s overpowering – the change would be so drastic – as to effectively disfigure the block – making it a lot less welcoming – more sterile – more gentrified. The City may very well still take the tree out. Its experts say that, their contractor says that. Don’t they? That’s what Drew Potocki said during the Planning Board meeting. But if you dig a little (no pun intended) into what little documentation the City has provided for their case against the tree, you can find fault in Potocki’s logic. For example, two of the City’s experts say that the adjacent sidewalk needs repair – and no one disagrees with that. It is broken and the root has cracked it. It has never been permanently repaired. So the experts say, well, if you repair the sidewalk, you’ll cut the roots of the tree, thus make it weaker and more dangerous – so – this logic goes – it must be removed. No ifs and or buts. Yet – over on the 4600 block of Saratoga Avenue – 3 blocks away – the City has done great things with the sidewalks to save the Torrey Pine trees there. Why can’t the City do something like that on Long Branch? The City has not even addressed this. Why not? It was their work on Saratoga. So, there’s questions like these that need to be addressed before anything is done to the Long Branch Torrey Pine. So, please pardon the following details, but come along for a journey into the fight to save just one Torrey Pine, and allow me to share and spell out the issues here and gather some recent history and post it all together. Torrey Pine in Del Mar, north of the Torrey Pine park. Photo by Monique Bowen. The Torrey Pine tree (pinus torreyana) is one of the rarest pine trees in America and even the world. Whether it is the very rarest in the U.S. is up for contention. Right now, there are only two locations where it grows in the wild: Santa Rosa Island in the Channel Islands 175 miles off the coast of Southern California and in Del Mar, up the coast from OB. Today’s large Torrey Pine trees in Ocean Beach were all planted back in the Thirties. Called “Soledad Pine” by the Spaniards, the species was renamed in 1850 by Dr. Charles Christopher Parry, a traveling botanist [part of the US-Mexico Border Survey party] in honor of his friend, Dr. John Torrey, the greatest botanist of his time. For centuries before the arrival of Europeans, the Torrey pine was an important source of food and craft materials for local Kumeyaay Native Americans. In fall they gathered the nutritious nuts off the ground. They used the sap to make glue and sealant and the needles for coiled baskets. By the time San Diego was settled, there were only several groves of the trees left up in Del Mar. Local philanthropist and newspaper publisher Ellen Browning Scripps bought the grove of trees south of the Penasquitos Lagoon to protect them and their native area, and with her foresight and generosity donated the core grove that eventually became what is today the Torrey Pines State Natural Reserve. Among trees, pine trees in general are the longest living trees in the wild. And among pine trees, Torrey Pines have some of the most longevity. It takes most species of pine trees two years for their pine cones to mature; for Torrey Pines, it takes three years. And according to experts, Torrey Pines in the wild live 200 years. The roots of Torrey Pines can spread out far beyond the length of its branches; a forty foot tree can have 2 to 3 times that length in roots. In the wild, they are known for their deep roots and wind-blown shapes. The Torrey Pine is an endangered species. An endangered species is one that is at risk of being extinct. Coastal communities that are fortunate to have Torrey Pines in their midst treasure them for their unique history. Within the City of Del Mar, the Torrey Pine is protected by law, having become their “heritage” tree. And in Ocean Beach a few years ago, strenuous efforts were made to protect the strand of Torrey Pines on the 4600 block of Saratoga Avenue. Buckled sidewalks were removed and re-poured to fit around the trees and metal grates were put in place to be able to move when the earth and trees grow. Under citizen pressure, the City of San Diego did this. San Diego in general honors the Torrey Pines, and has named the following sites after them: Torrey Pines State Natural Preserve, Torrey Pines Golf Course, Torrey Pines Gliderport, among others. The first source of protection came in 1885 from the San Diego County Board of Supervisors. They posted signs citing a reward of $100 for the apprehension of anyone vandalizing a Torrey pine tree. In 1888 the grove of trees on Santa Rosa Island was discovered. That added to a mystery about the trees and the growing momentum for some kind of protection. Plus California formed a State Board of Forestry that same year. However, there was apparently a set-back two years later, when pueblo lands that included the Torrey Pines area were leased for cattle and sheep grazing, and trees were cut and used for firewood. Finally in 1899 the San Diego City Council voted to set aside 364 acres as a public park – this was the very first park of Torrey Pine trees, but unfortunately it did not include specifics to protect the Torrey Pines themselves. After the turn of the century, the lands surrounding the park were in danger of being commercially sold. Between 1908 and 1911, newspaper woman and philanthropist, Ellen Browning Scripps, acquired two additional pueblo lots and willed them to the people of San Diego. This added to the park the area of North Grove and the estuary. Botanical studies of the park by San Diego Society of Natural History were conducted in 1916, and their findings of damage caused by people picnicking and camping reignited the public movement for the trees’ preservation. In 1921, the first custodian of the park was named – Guy Fleming (today there’s a trail named after him). The next year, Scripps had a well-known landscape architect map out a long-term plan for the park. And by 1923, the Lodge was built. The City Council added more pueblo lands the next year, and the park gradually grew through the years – but not before other threats to the Torrey Pines. Between 1928 and 1930, the League To Save Torrey Pines fought and won against a proposed cliff road above the beach. The purpose of the road was to eliminate curves and grades in the old road. The opponents felt that the road would not only destroy a section of the park but would also be costly to build. One of the reasons the League was so against this new road was that it called for using landfill in the canyons so that the road could go across them. Another threat occurred during World War II when the Army leased leased 750 acres of Torrey Pines Mesa from the City for training purposes including anti-aircraft artillery. Up to the late Fifties, the Torrey Pines park was under the authority of the San Diego Department of Parks & Recreation. Citizens and government managers did not believe the City had sufficient authority to protect the endangered species within it, so in 1956 a special city election was held which resulted in handing the nearly 1,000 acre park to the State of California, for it to become a state reserve. About 100 acres were appropriated for the construction of a public golf course. The State Park became official in 1959. In 2007 the nomenclature was changed to Torrey Pines State Natural Reserve. One of the projects of the WPA (Works Progress Administration) during the early Thirties of the Great Depression, was planting young Torrey Pine trees from out of one foot high-gallon cans on both sides of Catalina Boulevard, from the old gate to Cabrillo national monument. The Torrey Pine trees for the project were raised in Ocean Beach by David Cobb, a County employee who had some land on Saratoga Avenue for a nursery. Pine nuts from the Torrey Pines park were gathered and seeds were sprouted and they were transplanted to larger and larger cans, a process that took one to two years. The original project on top of Point Loma failed due to there not being sufficient protection of the trees’ roots from gophers, squirrels and rabbits, – although a few survivors can be found near the Fire Station on Catalina. Back in Ocean Beach, the Cobbs ended up with extra trees and they were planted along Saratoga Avenue and a few other blocks as well. If a Torrey pine tree is in good health and does not have any dead growth in it, it may never need pruning. All pruning should be done in winter months between the beginning of November and the end of February before warm weather promotes extensive new growth of shoots and foliage. Never allow a tree to be topped and never allow branches to be chopped off without leaving a remaining growth tip. (Topping is a discredited pruning system by which a tree’s height is lowered by cutting straight through branches or the trunk removing all tip growth further out or up from the cut. Above all, when pruning, never remove more than twenty percent of the foliage of a Torrey pine tree at any one time. Pines need a healthy canopy of foliage to provide food for their root system. Over-pruning combined with incorrectly placed cuts weakens trees and can stimulate excessive growth on remaining branches. More on our own Torrey Pine on Long Branch in Part Two. -Elizabeth Santo’s masters thesis , as quoted in Torreyana, 2008. Wonderful history lessson. Thanks for the story. La Playa – if you know of any of that history of planting Torrey Pines along Catalina out to the Light House, please let us know. One lesson we can take from this is how maintenance of our trees is so important. Our city must stop wasting our tax dollars and get serious about infastructure needs and maintenance of roads, buildings, parks, trees etc. Taking care of what we have BEFORE building anything new should be a priority. Our government should lead an example not be an exception. 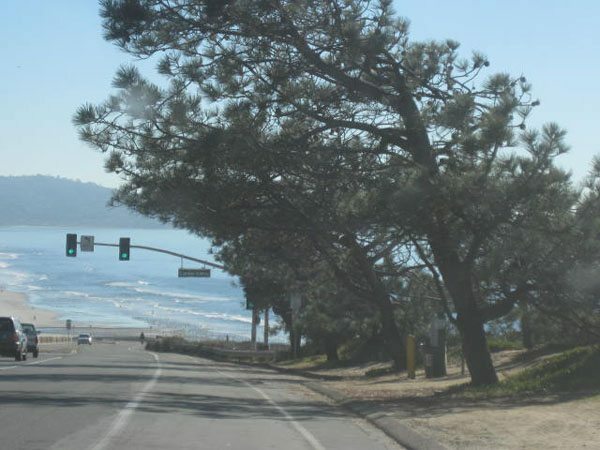 On another note, does any one work with photo shop to show us what the street would look like without this Torrey Pine? Today when I drove by to look at the tree again, the man who lives in the house across from the tree was in the street talking with a man (gray hair, glasses) who is on the OB Planning Board and was at that meeting last Wednesday. The homeowner said that about two years ago a Torrey Pine fell on a house on that block. Does anyone know anything about that? Is it true? If so, what were the circumstances? Was it really a Torrey Pine? Was it diseased? Thank you for all the photos of “leaning” Torrey Pines around San Diego. Every new bit of information is an eye-opener. I do think the energy and the focus should be on the safety, rather than the beauty and the specialness. No matter how wonderful and significant, IF the tree is a danger, we do not want anyone/anything to be hurt/damaged. I lived on that block for over 5 years. No, no Torrey Pine has fallen on that block this century. There was a Torrey Pine in a neighbor’s back yard that was trimmed but it never fell. There was a diseased and near-dead tree removed on that block closer to Ebers, but it was a smallish tree and NOT a Torrey Pine. We are emphasizing the safety issue by showing that these types of trees do grow at a slant. 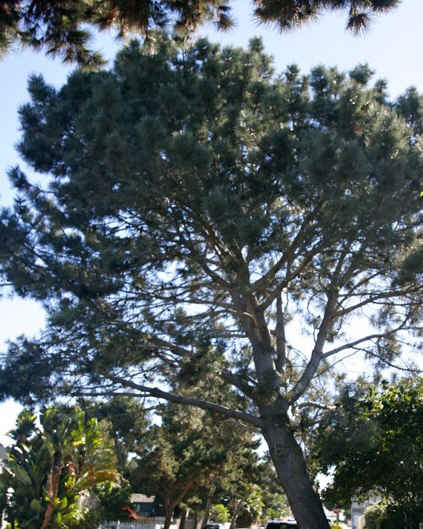 Our experts are saying this Torrey Pine is very healthy. This tree is not a danger, but we’ll let our experts tell you that in upcoming reports and evaluations. the City of San Diego. Obviously, cases will arise when a Torrey Pine tree must be pruned or removed, which would violate §63.07. In such a case, who has the legal authority to declare an exception to §63.07? Would that legal authority belong to the Urban Forester, the local Planning Board, the City Council, the Mayor, a judge, or someone else? Or is it an undefined loophole in the Municipal Code? It is unclear to me exactly who has been granted the legal authority to make that decision. There is also, Wireless, a city ordinance that states that city employees may act when there are dangerous conditions to mitigate the dangers and hazards. omg, do not leave the issue of ‘danger’ in the sole judgement of one person. I’m on the OBPB, and can’t speak for them or even really “o-pine” on this is much detail, but there are a few facts and pieces of info mentioned at that public meeting that readers here should probably be aware of. 1. Saratoga is a much wider street than Long Branch, and what was done with the sidewalks there next may not be possible without going into the front yard of the homeowner adjacent to the Long Branch tree. 2. At least one homeowner on that block feels the slant of the tree has increased in the past year or so, although that has not really been quantified. 3. There is a pregnant woman who lives directly across the street from the tree. Anything beyond that, I can’t really speak to until more information becomes available. I do hope there is a way to retain the tree safely, though. I gotta know why the reproductive status of the woman across the street from the tree is in any way relevant to the removal (or rescue) of a tree. Sarah, without any opinion of my own offered, I can inform that one of the major topics of discussion at the meeting was the level of public safety risk posed by the tree. The tree is 80 years old, and a googling would show many lifespan estimates for Torrey Pines being 100 years (some ranges may go as high at 150 years). I certainly invite anyone to go look at the tree, read any of the reports being presented and ask themselves what level of risk does or does not exist, whether or not there are any particular properties that might be at higher risk than others, what the possible outcomes of any risk might be, what possible risk mitigation strategies actually exist and ask themselves who among us is entitled to decide what an acceptable risk is for others? My reporting the reproductive status of a neighbor was not an attempt to position this as “tree vs baby”, or anything like that. It is just a factual piece of information that you can do with what you please. Speaking for myself, I am interested in getting as much information as possible about this before helping to make any potential non-binding, advisory recommendations to the City on behalf of the community. Hmm…I gotta know what effect the tree has on the pregnant women or what effect the pregnant woman has on the tree. Now the dialogue gets even more interesting. Does our community plan or updated community plan have info in it on trees….number of, types, potential problems, future tree planting, history etc.? I surly do know now a hell of a lot more than I ever did about Torrey Pine Trees… It’s like this ONE tree in Ocean Beach is willing to sacrifice its life just so human beings can become more informed about its pine specie and their fight to remain intact and living as an integral part of the natural world. If I offended anyone here by using the word “hell” in my previously posted comment, I humbly apologize…. I truly didn’t think it would bother anyone or I wouldn’t have used it in the first place ! If it DID bother anyone, please let me know along with letting me know if it DIDN’T matter to anyone also… Thank You. pssst: I was not offended. Michael Chen from Channel 10 News just informed us that they had a lot of viewers follow their piece about this tree. Channel 10 BTW is the only news station to pick this story up. I have found this story very interesting. One thing that strikes me: I’ve seen nothing written about anyone involved in the decision having any truly relevant qualifications. Risk can indeed be quantified. A competent arborist can do this. The credential that would indicate qualification for the job is “Certified Tree Risk Assessor” . A list of arborists who have this credential can be found on the website of the Pacific Northwest chapter of the International Society of Arboriculture. Once risk level has been determined, the tree owners can decide whether or not it’s above their risk-tolerance threshhold. As far as I can tell, the Torrey pine is not a Federal or State listed endangered or threatened species. If it were a listed species, it would be much more difficult for the city to remove it, but it would also mean the numbers of individual species would be much more reduced (at bit of a catch-22). The California Native Plant Society, however, considers it a rare species which, I believe, does make it a specie of concern. According to Wikipedia: The Torrey Pine, Pinus torreyana, is the rarest pine species in the United States, an endangered species growing only in San Diego County and on one of the Channel Islands, endemic to the coastal sage and chaparral ecoregion in the U.S. state of California. What reference did you use regarding the proper trimming of a Torrey Pines tree? We have some in our neighborhood that need trimming. There are some really good Torrey Pine tree trimmers. Theron Winsby of Pro-Trees is the one we used for the tree on Long Branch. I don’t live anywhere near the coast, I live in El Cajon on Pepper Drive and when we moved here 10 years ago, the huge Torrey Pine on our property was the tallest tree on the top of the hill here. The trunk of this tree is so big as it stands over 100 feet tall. It was always so green and kept our house cool in the summer. It’s located approximately 9 feet away from the corner of our house. Sadly, something has happened to it and it is completely brown, and dropping sap all over our deck and there is a rusty brown colored dust all over our deck. I can still see some pine cones here and there, but what would make such a big huge tree die like that? Maybe because of it’s size or age? Is this a natural occurrence for a Torrey pine? We live in the one of the only unincorporated areas in the middle of El Cajon on private property which we own. We are unsure of what to do or who we should call. We are sad that the tree appears to be dead and I would think that someone or some organization would want to investigate why the tree has died (beetles, disease, drought??) and what we need to do to remove it without breaking any laws or ending up on Channel 10 news for having it cut down. Who do we need to contact?? HELP!! Older Article: Torrey Pines – Are they leaning or growing at a slant?